Buffet breakfast was awesome! Liked that all the pet friendly rooms were close to dog walk. Location was excellent to our sports center. Very nice and clean hotel will definitely go back if I’m in Orlando again. the bed was very comfortable, slept like a baby. The outdoor pool was very nice and clean as well. Didn’t get to go to the restaurant/bar in hotel since we had so many plans but it is definitely a nice feature. Very clean, accommodating staff, awesome food, loved the hot tub. The property is very nice. Our room was nice and the pool was amazing. The people were nice that worked their as well. Love the shuttle and the gentleman working was great! The bed was comfortable, house keeping did a great job cleaning. The hotel allowed me to have an early check in due to an early flight. The water actually stayed warm long enough to have a complete shower for me as well as my son. The location is convenient to an extent. It is about 10 minutes from the airport. The staff was great. They were friendly and helpful. The rooms were clean. The location was close to everything. 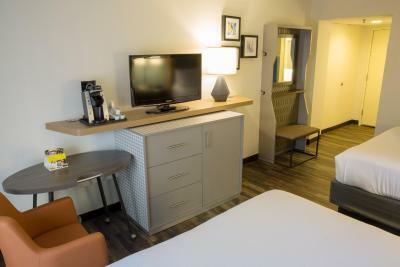 Holiday Inn Orlando International Airport This rating is a reflection of how the property compares to the industry standard when it comes to price, facilities and services available. It's based on a self-evaluation by the property. Use this rating to help choose your stay! One of our top picks in Orlando.One mile (1 mi) from Orlando International Airport and featuring free 24-hour airport shuttles, this hotel is near several area attractions and offers an on-site restaurant. The Holiday Inn Orlando International Airport is located a short distance from the Florida Citrus Bowl and the heart of downtown Orlando. Popular area theme parks, including Walt Disney World and Universal Studios are also easily accessible. 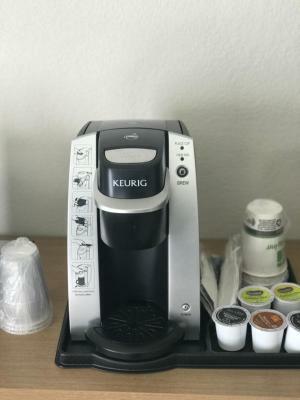 Thoughtful amenities at the Orlando International Airport Holiday Inn include a 24-hour fitness center, in-room coffeemakers and free wireless internet. 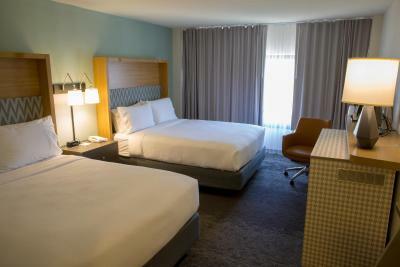 When would you like to stay at Holiday Inn Orlando International Airport? This room features a cable TV, desk, and tea and coffee-making facilities. This room, on an exclusive floor, includes a daily continental breakfast, microwave, and small refrigerator. A bathrobe is included as well. House Rules Holiday Inn Orlando International Airport takes special requests – add in the next step! Holiday Inn Orlando International Airport accepts these cards and reserves the right to temporarily hold an amount prior to arrival. If booking a meal plan rate, please note that Breakfast Included rate includes breakfast for 2 adults. Additional charges apply for further guests. Please note the lobby and guestrooms are currently undergoing renovation until 28 February 2018. During this period, guests may experience some noise or light disturbances, and some hotel facilities and services may not be available. Large crack between door and wall which made room noisy from hallway. 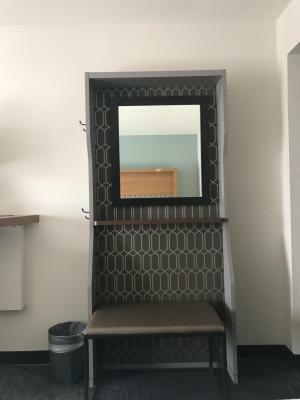 We paid cleaning fee for our dog, so would expect room to be clean at checkin. I cleaned up water that dripped from water bottle. The white wipes were black from dirty floor. Was apparent that floor had not been cleaned in awhile. Definitely wore shoes while in room. Check in was awful. Gentleman was uninterested in answering questions and appeared to be distracted. First told us he only had king beds when we requested two beds then after settling for only King beds then finally told us their was a pull out sofa in each room. He definitely needs more training. The air conditioning unit in the room was very noisy. Even when turned off it still cycled about every fifteen minutes which effectively deprived us of any real sleep. When I mentioned it on departure apologies were offered but there was not mention of getting it looked at. It was adequate for what we needed which was a one night stop before heading off elsewhere. Didn't use any of the facilities. 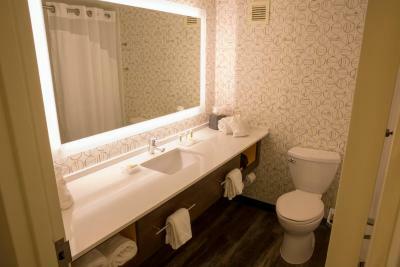 Great location, pleasant staff, clean! 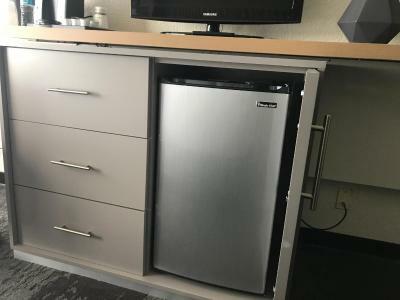 Just needed a place to stay the night before a cruise. Met my needs. Loved that there is a Denny's across the street. Hard to sleep near the main road side, can hear the traffic all night. Not much to complain about, When booking in advance, one may reserve rooms with more savings then what I payed last minute. The staff at this hotel are super friendly! The rooms are clean, and the scenic property is a nice location for walking. Convenience store and restaurants are within walking distance. It was a perfect location for my visit, and the shuttle service to and from the airport was a big help!